All the foreigners and locals who bought their tickets to watch our talented Jamaicans at the National Stadium over the weekend were left disappointed. Not only did Usain Bolt pull out of the 100 and 200m due to a Grade 1 Hamstring tear but so did Elaine Thompson. Why? She hasn’t even made her name fully on the International circuit, not that who you are should exempt you, but it is alleged she just felt a twinge somewhere. Shelly Ann Fraser Pryce also pulled out of the 200m but it is known she has been battling with a toe injury. So now she just has to put all her eggs in one basket for the 100m in a packed field. Gamble much? It is said that Elaine Thompson will get exempted. What kind of effect will this have on future trials? I think the rules will be changed or restrictions will be put in place so athletes know they need to perform if a severe injury was not declared before the trials or it will be a free for all. Mike Rogers of the USA certainly had a lot to say about Usain Bolt not running, along the lines that he should run because they don’t get that option, they wouldn’t be exempted. Perhaps he should have been spending more time preparing to make it to RIO to run in the 100m instead of running his mouth because he ran 10 flat, failing to qualify in the top 3 last night. So yes, let us talk about where the US athletes are at. They are looking quite good. The ladies have a strong team and should win the 4×100m unless they have a mishap. All eyes were on Tori Bowie, the favourite, Tianna Bartoletta who also qualified for the Long jump and English Gardner. Bowie started out ahead, then came Bartoletta but at the end of the race English Gardner passed them all in 10.74s! Bartoletta and Bowie clocked 10.78s. Impressive. English Gardner after many disappointments is certainly determined and coming hard for RIO. After the race you can usually expect some antics from the Americans. She made the motion of eating food from her plate to the camera. She definitely has bulked up in size, so does that mean that eating some food did it? Or is she familiar with the Jamaican saying and was telling rhe world and Jamaica that ‘she jus eat dem (Bartoletta and Bowie) food’? Who knows. But she is on our radar. Dafne Schippers who Jamaicans call the ‘Dutchie’ will be running the 100m this Friday at a Manchester meet at about 7pm. For the US men’s 100m, Gatlin who is now greying at 34 years old ran 9.83s in the semifinal and lowered that time to win the final in 9.80s. Trayvon Bromell clocked 9.84s and Marvin Bracy clocked 9.98s. Mouthy Mike Rogers came 4th in 10.00s and Tyson Gay, 5th. We are not worried about their 4×100m team though. The antics after the race? Justin Gatlin said they are going to get the 1-2-3! Hilarious. Looks like he is greying and becoming even more delusional. Moving on to the 400m Men. La Shawn Merritt is back! He won in 43.97s, the only sub -40 time this year. Not even the Donkey man can catch that for Jamaica. We also have South Africa and Grenada to think about. So who took it? Felix the cat of course. Allyson Felix suffered a severe ankle injury months ago but she isn’t going anywhere. It is known how much of a fierce competitor she is. Felix came around the curb in 4th and Hastings was way ahead. She somehow found another gear and burnt up the stretch to win in 49.68s, breaking sub 50! Our athletes are nowhere near that time. Can’t touch our ladies for the 4×400m though. Strength in numbers. Phyllis Francis came 2nd for the USA followed by Natasha Hastings who usually goes out too fast and does not have enough for the finish. Felix will be contesting the 200m later this week. It’s going to be quite a summer! 200m Finals Today and more at The National Stadium! The track will heat up again today even without Usain Bolt. Usain Bolt is ranked 3rd in the world for the 200m and according to the JAAA rule he can therefore seek medical exemption from the 200m, once in the top 3 in the world. He will have to prove his fitness in the 200m as well before RIO. The ladies are looking good for the 400m. It should be a showdown. Christine Day and Stephenie McPherson have been showing they are the ones to beat but it’s all about the final. Will Shericka Jackson and Novlene Williams-Mills have answers for them? For the 200m men, Warren Weir still looks wary coming off of injury. Can he make it to Rio? Yohan Blake looked the best yesterday, quite comfortable with 20.30s. Nickel Ashmeade and Julian Forte are the other athletes expected to step up for 2nd and 3rd. Ironically, Nickel Ashmeade seemed to have a false start in the 200m last night, though there was a slight possiblity there could have been a fault with the blocks. Looks like he was ‘given the benefit of the doubt’ and got off with a warning. Hopefully the false start drama doesn’t follow him to the final, though Friday night for the 100m there was no doubt about it that Livermore was the culprit for the false start. For the 200m ladies, Shelly is in it but still not herself. Elaine looks just as good in the 200m and should take the win. Simone Facey looks good as well but did she put out too much too early like how she did in the 100m? She secured a good lane though as she ran hard to finish ahead of Shelly in her semi final. Veterans Kerron Stewart and VCB are also going for it. However it looks like age has finally caught up with VCB. She can still put fast times out there but she is suffering to produce them after the rounds. The 100m hurdles women final should also be a treat. Is World Champ Danielle Williams ready? Here is your schedule. Have fun Jamaica! TGIF! 100m Finals for Men and Women at the Stadium today! Who is going to RIO? The finals will tell what kind of form everybody is in. Good luck to all the Athletes later. 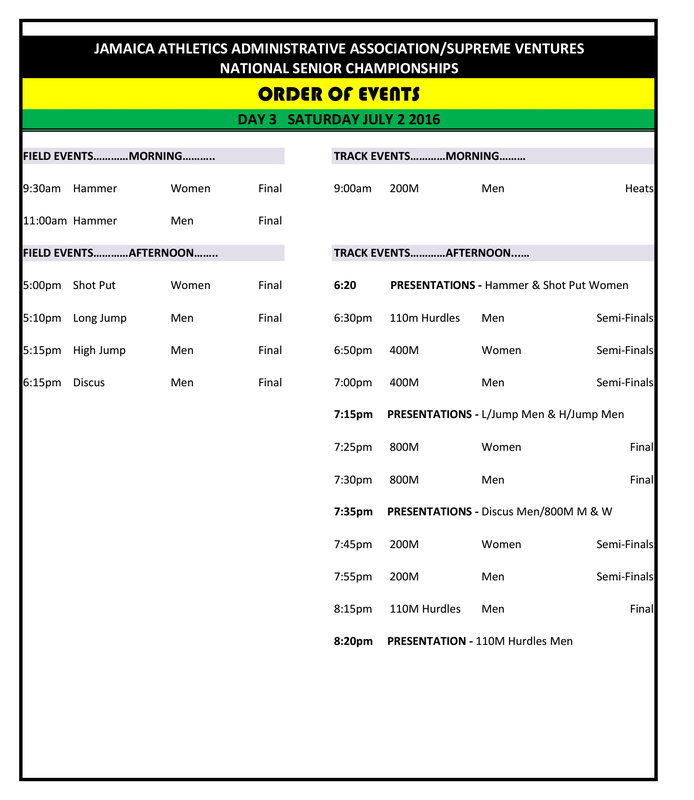 Jamaica Senior Olympic Trials start TODAY! The Men’s 100m field is so packed they need a Qualifying round this morning! Women’s 100m Heats later! What a week in Sports! Drama everywhere! Euro2016 started last Friday. Already, Russia has faced investigation after Russian fans rushed (no pun intended) England supporters at the end of the game, which was drawn 1-1. Russia had equalized in overtime. Both Russia and England have been warned against possible elimination if violence continues. Brazil beat Haiti 7-1 last Wednesday. On Thursday, Venezuela beat Uruguay 1-0! Suarez was extremely upset he couldn’t play and threw a tantrum on the sidelines. The same night, Mexico beat Jamaica 2-0. Poor defending cost Jamaica the first goal, a simple header by Chicharito at 18′. It was an exciting match, but Jamaica just failed to convert the many opportunities and chances on goal, especially Donaldson who was also denied a penalty. Peralto who substituted Chicharito sealed the deal for Mexico, scoring at 81′. Mexico advanced with Venezuela to the Quarterfinal for Group C. USA and Colombia advanced from Group A. The outcome of Group B with Brazil, Peru, Ecuador and Haiti is to be determined, as well as the Group with Argentina, Chile, Panama and Bolivia. Mohammad Ali died a week ago at age 74. His public memorial service was on Friday in Louisville, KY. Ali inspired the famous movie, Rocky. The Legend’s memory will live on. 5-time Major winner, Maria Sharapova has been suspended for 2 years by the ITF for breaking anti-doping rules. She will appeal. Speaking of doping, Jamaica’s sprinter, Nesta Carter’s ‘B’ sample confirmed the presence of the substance, methylhexanamine, a banned stimulant after tests were carried out by the International Olympic Committee (IOC) from the 2008 Beijing Olympics. This could cost the 4×100m team from the 2008 Beijing Olympics their Gold medal. He will soon have his case heard by the IOC panel. Sanya Richards-Ross of the USA looking to run her last Olympics seemed to have twisted her foot in a 100m race used for speed training in Atlanta. She fell to the ground screaming mid-race and had to be carried off the field. She hasn’t been running good times in the 400m and she came 7th in her last competitive race but this may harm her hopes of heading to RIO even more. The JN Racers Meet that took place on Saturday at the National Stadium was packed with talented athletes, most of whom should be heading to RIO. It was a great day for sprinters with a +1.0 wind. Shaunae Miller used her strength from the 400m to power through the stretch to win the Women’s 200m just short of sub 22s in 22.05s. USA’s Jenna Prandini had an excellent start and beat Miller on the curb but faded in the stretch finishing in 22 39s. Trinidad’s Machel Cedonio won the Men’s 400m in 44.37s ahead of Grenada’s Bralon Taplin and Jamaica’s Javon Francis a.k.a. ‘Donkey Man’. South Africa’s World Men’s 400m Champion, Wayde van Niekerk won the 300m just short of sub 31s in 31.03 ahead of USA’s LaShawn Merritt. He felt the energy of the crowd and enjoyed running here. Antigua and Barbuda’s Miguel Francis who trains with Bolt and Blake destroyed is PB time in the Men’s 200m finishing in 19.88s, the 2nd fastest time in the world this year. Jamaica’s Julian Forte was 2nd in 20.18s and Warren Weir just returning from an injury was 3rd in 20.32s. Rasheed Dwyer is yet to break 20.5s this season. Nadia Eke of Ghana won the Women’s Triple jump in 13.51m. For the Women’s 100m hurdles, USA’s Sharika Nelvis won in 12.61s, her SB ahead of Jamaica’s World Champion, Danielle Williams who finished in 12.77s. For the Men’s 110m hurdles, David Oliver of the USA won in 13.09s. Jamaica’s Deuce Carter came 2nd. He hit a hurdle mid-race so it could have been closer. Jarrett Eaton of the USA was 3rd. Then to the races everyone was waiting for, the Women’s and Men’s 100m. Shelly Ann Fraser-Pryce who has been having trouble from injury got her usual fast start and shook off Barbara Pierre of the USA who stayed with her throughout the entire race and even inched ahead of her at one point finishing with her SB of 11.09 and Pierre finished in 11.11s. Kelly-Ann Baptiste of Trinidad & Tobago was 3rd in 11.15s and Carmelita Jeter did not place. Sidenote. Never count out VCB for the Senior trials. She ran 10.83s in Florida today! Now to the Men! Bolt, Blake, Asafa, Nickel Ashmeade, Kemar Bailey-Cole and Frater ALL from Jamaica, Ramon Gittons from Barbados and South Africa’s Akane Simbine. Why not have a Jamaica race at the Olympics? All I know is, Usain Bolt is looking good, really good. He ran 9.88s after he stumbled at the start of race after a good reaction time to the gun, was behind the entire field and then pulled away easily. Nickel Ashmeade finished 2nd and Blake with his SB 3rd, both with 9.94s, Asafa 4th with 9.98 and Bailey-Cole 5th. They had no choice but to totally dominate Game 3 on home court to save face on Wednesday night winning by 30 points, 120-90. James had 32 points and Thompson came up big defensively and also had 13 rebounds. The Cavs would then look to level the series in Game 4 at home before heading back to California for Game 5 but things did not go their way. Curry came alive with 38 points and we still haven’t seen the Splash Brothers in these NBA Finals. Cavs coach, Tyronn Lue was fined 25k for criticizing the Referees after Game 4, saying ‘LeBron never gets calls’. LeBron fans would say he doesn’t make excuses for losing but once again, he was in agreement with this accusation made by Lue but didn’t go in on it because he said he would save his 25k. What he did do though, was provoke Draymond Green by stepping over him after Green fell to the floor on a play, knowing what was at stake for Draymond if he got 2 more technicals or any Flagrants called against him. Words were thrown and both made their case. Today, the League announced that LeBron James was assessed a technical and Draymond Green has been suspended for Game 5 of the Finals after getting a Flagrant Foul 1 from the incident with LeBron on Friday. Suga thinks this was unnecessary and the NBA are grabbing at straws to extend the series. Warriors’ Klay Thompson expresses that he guesses LeBron James’ ‘feelings just got hurt’ by Draymond Green and players talk trash and call each other names in the league all the time but ‘It’s a Man’s League’. Game 5 is tomorrow at 8pm! 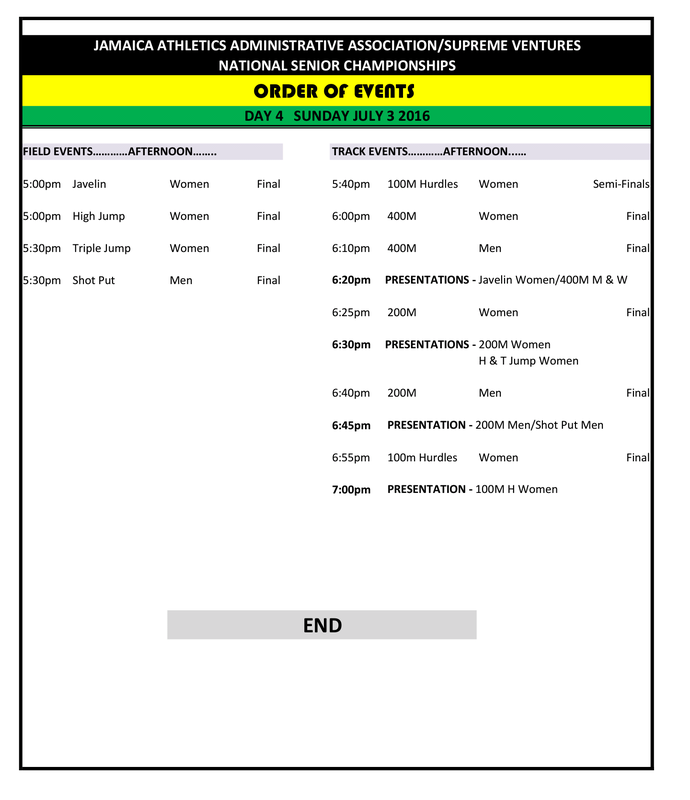 Jamaica International Invitational Meet this Saturday at the National Stadium!